‘The bowler is Holding, the batsman’s Willey’ | A balanced diet . . . I spent much of yesterday listening to Test Match Special (TMS) on BBC Radio 5 Live – I don’t subscribe to Sky Sports so couldn’t watch it on TV (except for the highlights in the evening). 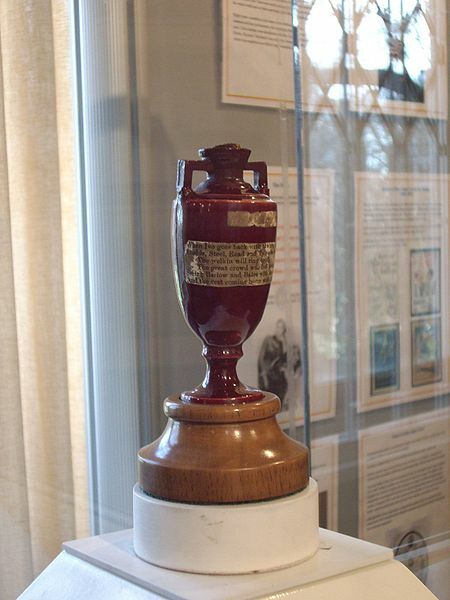 The Ashes urn is only six inches tall. Test Match Special? Well, for my many followers on this blog I’m referring to cricket. And yesterday, England won a remarkable victory over the Australians in the 4th Test Match (= match between international teams) of the summer 2013 Ashes Series (the rivalry between England and Australia goes back more than a century, and is fierce). I say remarkable, because midway through the afternoon session it seemed as though Australia were cruising to victory, having lost only two wickets for 168 runs. Then England fast bowler Stuart Broad found his mojo, and Australia were scuttled out 74 runs short of the required 299. So England win the five match series 3-0 so far, with one match (at Old Trafford last week) drawn, and one to play, at The Oval in London next week. My father was a great cricket fan, often spending a Saturday summer evening watching a local match at Leek Cricket Club, or occasionally traveling to Chesterfield to watch county side Derbyshire play. When I was growing up in the 1950s and 60s, there were few overseas players in the county sides, because they had to gain their residency in English cricket before they could play in the First Class (i.e. county) game. Many did this by playing for local clubs. So in the North Staffordshire League (I think that was its name) we could watch some of the world’s greatest players, such as West Indian batsmen Sir Frank Worrell and Sir Gary Sobers, and fast bowlers Wes Hall and Charlie Griffiths. Quite a treat to watch these players before they hit the big time, and for any team to come up against these players in the opposing side. I can’t remember anyone ever explaining the rules of cricket to me. Maybe it’s a ‘genetic’ thing – growing up with the game, I just became aware of how it was played. And at high school we did play cricket during the summer semester, although I was never good enough to play for one of the school teams. Cricket for me was much more a recreational sport. As a graduate student at Birmingham, a group of us would play a few overs (six ball deliveries) during the lunch break, and when I was based at CATIE in Turrialba, Costa Rica in the late 70s, we managed to scrape a team together, prepare a pitch, and challenge the San José Cavaliers to a limited overs match (which we easily lost). Even at IRRI in the early 90s we managed a game or two, and given the high number of staff and students from India, Pakistan and Bangladesh, that’s not surprising. Already, however, I’ve lapsed into jargon: ‘overs’, ‘sides’, ‘wickets’, etc. So for many, especially in the USA, cricket remains a ‘remote’ sport. In some ways that’s hardly surprising when you have fielding positions such as ‘silly mid on’, ‘silly mid off’, ‘slips’, gully’, and ‘deep fine leg’ to mention but a few. And the fact that Test Matches are played over five days, with lunch, drinks and tea breaks further adds to cricket’s unfathomability for some. Needless to say I have the same issues with American football and baseball. There has been a significant change in the way that cricket is played, with the expansion of the one day, limited overs, matches, and the more recent phenomenon: T20 (20-twenty), in which both sides have just 20 overs to score as many runs as possible. It’s a big thing in India, and fortunes are spent on promotion, commercialization, and key players. Not really my cup of tea. Yesterday’s match at the Emirates Durham in Chester-le-Street was a great exhibition of the very best of Test Match cricket. The balance of the game swung from one team to the other, until England finally made the breakthrough late on in the afternoon. Roll on The Oval! Listening to a cricket match on the radio is also special – but you have to know something about the game, and the field placings, etc. to fully understand the commentary. I grew up listening to the likes of John Arlott and Brian Johnston and later former Australian captain Richie Benaud. Other commentators have come and gone, but the current crew are, in the main, very good (Jonathan Agnew, former England captain Michael Vaughan, former England opener Geoffrey Boycott, Henry Blofeld, and others). Then and now, you can detect the camaraderie among the commentators, and the fun they are having – as well as their love of cricket. But commentating live has its pitfalls. And this is how it was. Here’s Aggers setting up former England captain Michael Vaughan. https://mikejackson1948.files.wordpress.com/2013/08/aggers-and-rubbers.mp3Lots of great commentating, lots of humour – and lots of cakes sent in by listeners, which became a TMS tradition which endures to this day. And it’s not just during cricket matches that commentators wish they could rewind the tape, so-to-speak. Out of the mouths of babes and commentators, come some of the best unintended double entendres, which I discovered earlier today on the Internet. Enjoy! 6. A female news anchor who, the day after it was supposed to have snowed and didn’t, turned to the weatherman and asked: ‘So Bob, where’s that eight inches you promised me last night?’ Not only did HE have to leave the set, but half the crew did too, because they were laughing so hard! This entry was posted in On my mind . . . and tagged cricket, double entendre, The Ashes.